I am multi-tasking: I am picking black currants, and I am stroking Arthur. This is not the most efficient way to pick black currants, but it makes Arthur happy. Arthur is also multi-tasking: he is being stroked and he is also being happy. He experimented for a while with the concept of sharpening his claws on my bottom at the same time as the other activities, but my sudden surprised yelps were intended to suggest that this was taking efficiency one step too far. 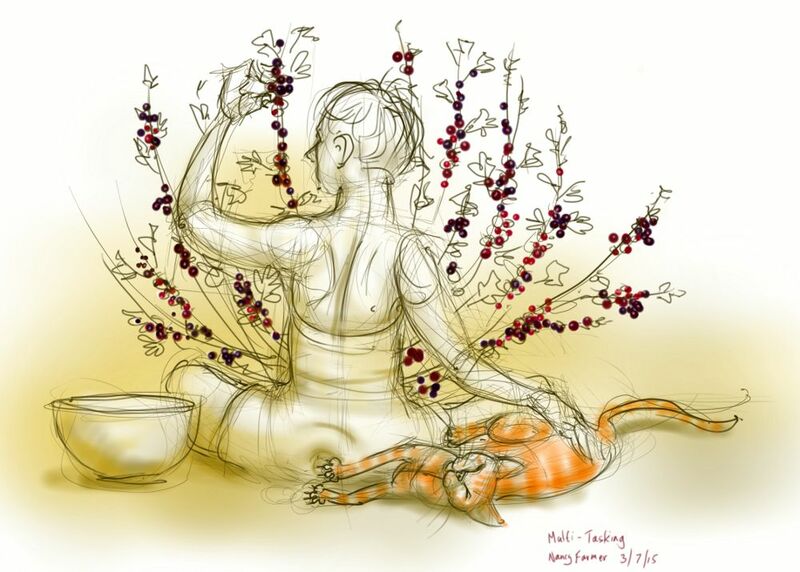 This entry was posted in Cats, Plants and tagged art, arthur cat, black currants, cat drawing, cat-of-the-day, ginger cat, illustration, multi-tasking, plants on July 3, 2015 by Nancy Farmer. Aww. This is fun and cute. Love that cat’s expression 🙂 The Zen’ness of this is neat, too.